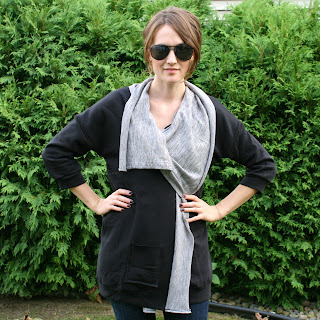 la vie DIY: DIY Jet-setter Wrap.... WHOA, DANG! DIY Jet-setter Wrap.... WHOA, DANG! So... I have not been this excited about a project since the beach wrap. I love this. It absolutely didn't turn out to be what I had in mind, but sometimes that isn't always a bad thing. 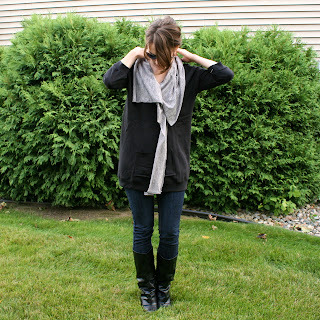 I was inspired by a Calvin Klein wrap sweatshirt that I found at Georgie's, my favorite consignment shop. Georgie's ROCKS. It's located in a very wealthy suburb of Grand Rapids, Michigan- which means you can snap up rich people's discards at great prices! I often find fantastic buys- including *the* cutest Juicy Couture (brand new in package) gold bow necklace. Ah. I love it. I wear it nearly every day. Anyway- we're taking a trip to Europe in a few weeks to see my dear, dear friend Tabea get married. Her family is my German family and I *can't wait* to see them again, to (finally) introduce them to John (though the eldest attended our wedding and stayed with us for a bit) and to see this wonderful, inspiring girl say her vows. Of course, travel requires certain attire to make the trip most pleasant. I'm not a fan of flying and especially dislike long overnight flights. I always look for clothes that are comfortable but still look nice and put together for flights. 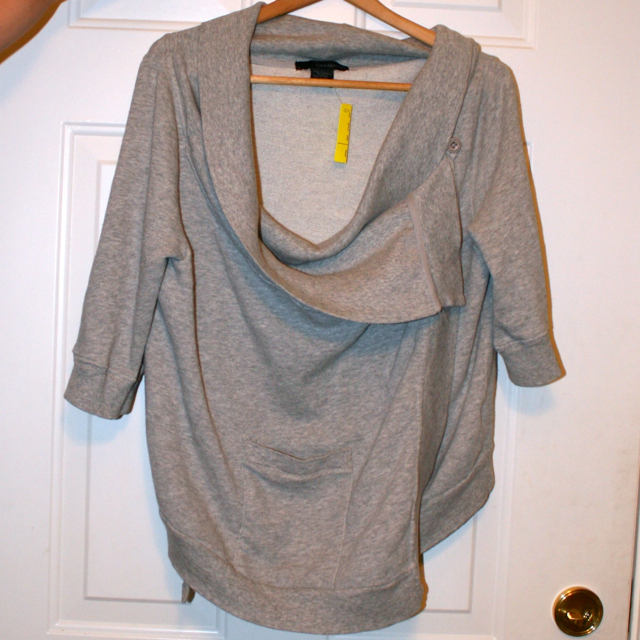 When I saw the Calvin Klein wrap sweatshirt at Georgie's I knew it was perfect. I bought it, even though it was two sizes too big for me and then had some buyer's remorse. I decided to try to replicate it and that is how this sweatshirt came to be. Calvin, you brilliant man, you. 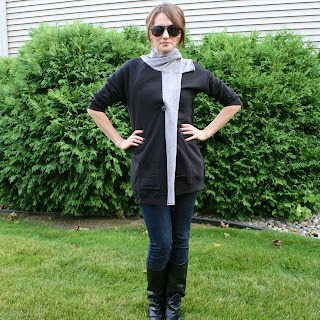 So if you want to make this exact sweatshirt, I figured out while doing it terribly wrong. Stay tuned for a future post. Instead I ended up with this Jet-setter wrap, which I actually like just as much and has a much more versatile set of ways to wear it. 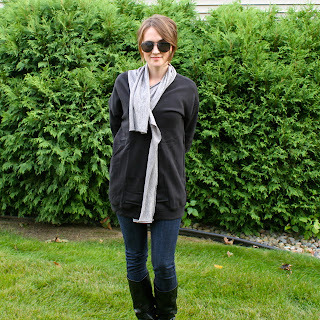 Start out with a sweatshirt. Goodwill is a great place for them. I bought a men's XL thinking that a size larger than I am (I wear a women's XS) would work well. It didn't. I ended up taking the back in a lot. So just get one a size or two too big. 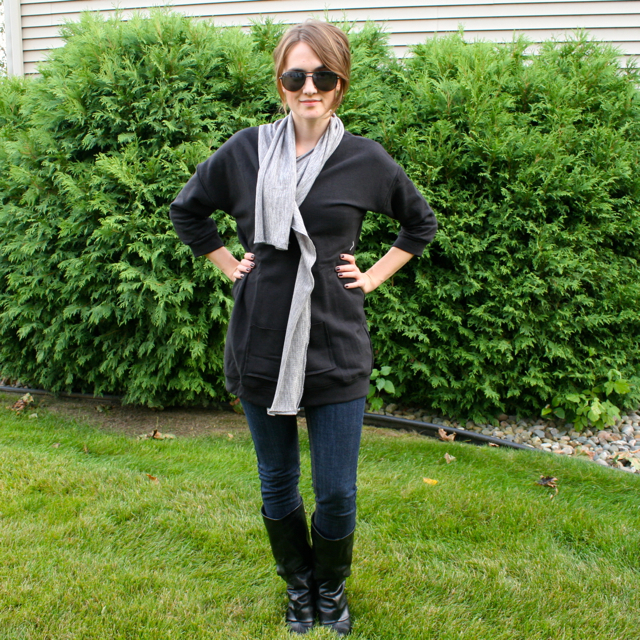 Cut a straight line from top to bottom in the front and center of the sweatshirt. Next we move to the sleeves. I wanted to make them short like they were in the Calvin Klein version, but that isn't necessary. If they're too big, take them in (SEE THIS TUTORIAL). If you'd like them to be shorter, follow along! 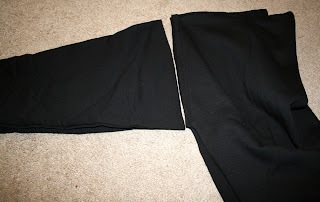 Start by cutting each sleeve off at the seam. Then cut them down to the length you want them to be (mine are about 12 inches). 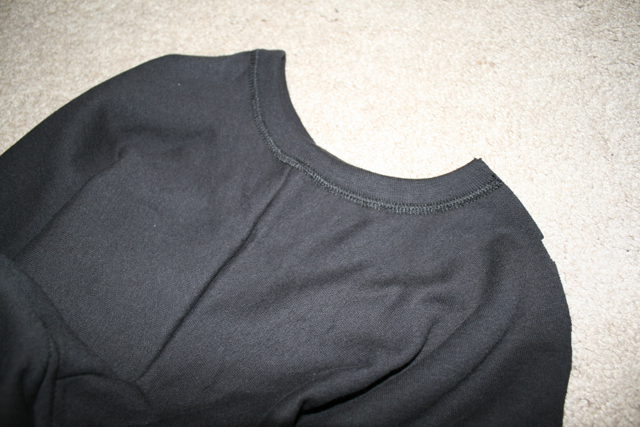 Remember, you'll be using the side that has the wristband hem, not the side that *was* attached to the shoulder. 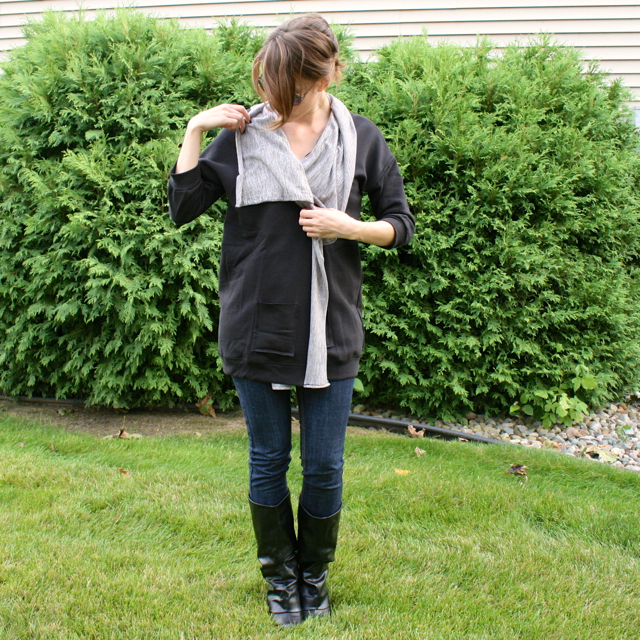 Set the excess aside for pockets (optional). This is the hardest part, I promise. You'll need to reattach the sleeves now and possibly close up some gaping on the side seams if your new armholes are smaller than the old ones. 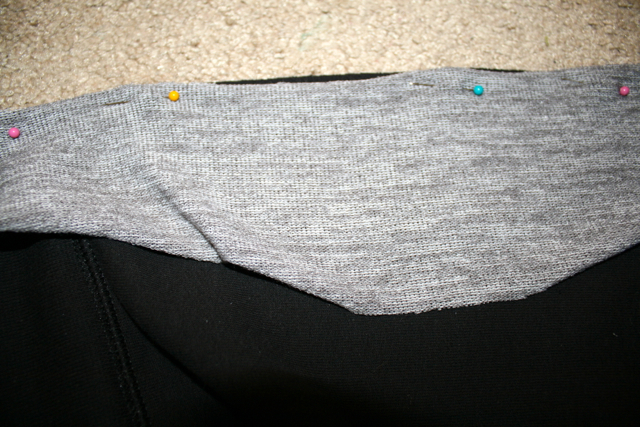 I like to start by putting the sleeve through the sleeve hole. I say this because I didn't the first time around and I *perfectly sewed* the sleeve on inside out and had to redo it. Rage. Next you'll pin the sleeve to the armhole. Check my pics to make sure you've got it lined up right. 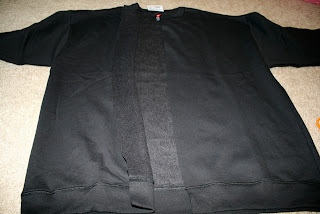 You'll want the sweatshirt to be inside out and when you look into the sleeve, you should see the fuzzy side. Pin all along and then pin the extra area closed that may be gaping if your armholes are too big for the sleeve. Stitch it up with a zigzag. I didn't do much to the collar. I just folded the sweatshirt on the shoulder seam (MUCH LIKE THIS TUTORIAL- see for clarification) and then cut all along the crew neck, taking about an inch of fabric off. 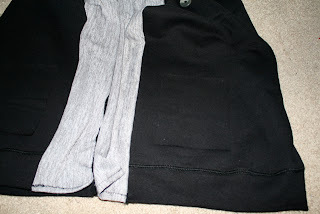 2 strips 4 inches wide and as long as your sweatshirt from top to bottom + seam allowance. 1 strip as long as your sweatshirt from end to end (at the top) + extra for hanging prettiness. I used about 3 extra inches *on each side*. Also- my top piece was about 12 inches wide. For all of these pieces, you can make them longer/shorter/wider/thinner based on your preference. I experimented. Originally the pieces hanging in front were about 5 inches longer than the wrap. 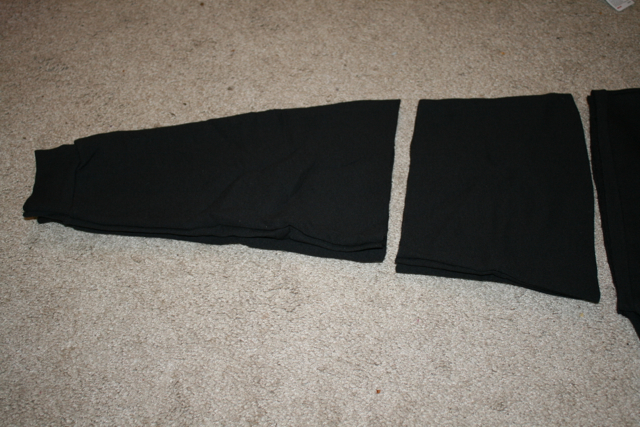 I cut them down to size, but left the collar wider on each end. 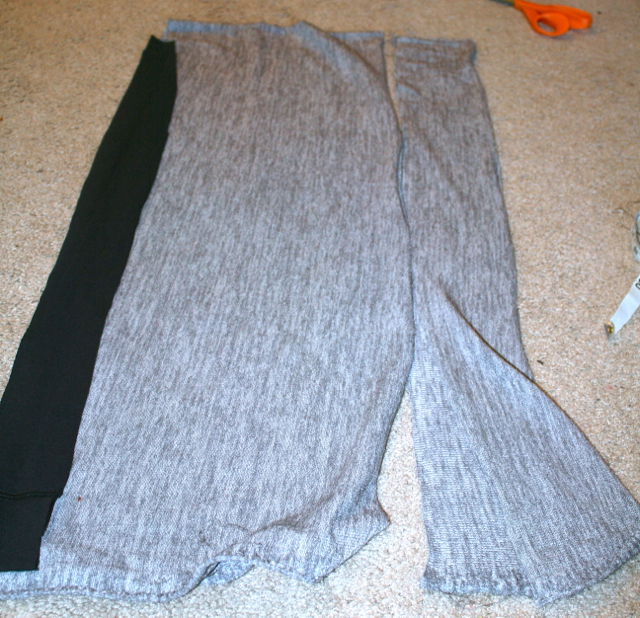 On each side of the front opening, attach one of the two front pieces. 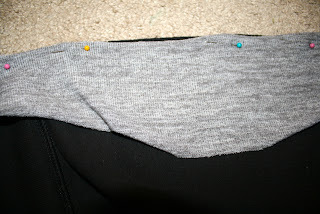 Make sure "right sides" are facing each other and then pin and run through the sewing machine (straight stitch). 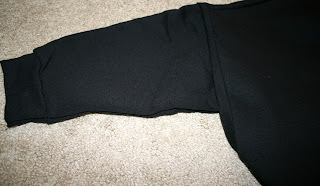 "Right sides" would be the part of the fabric that people see. This is what it should look like at this point. Do you see that my front pieces were still long here? I liked it open, I didn't like it closed and wanted the ability to vary the look. At this point decide how long you want yours and hem accordingly. Straight stitch again. 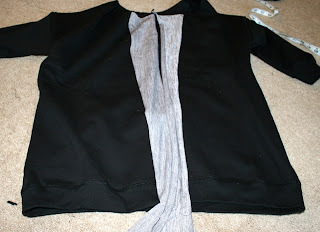 Attach your collar piece next, centering the piece so that the same amount of fabric hangs down on each side (unless you want asymmetrical!). 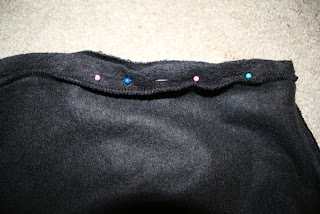 Pin again with "right" sides facing each other and run through the sewing machine with a straight stitch. Last part? Details. These are all optional. I added a button to mine- which was very simple but hard to explain. I literally stood in front of the mirror and held one side of the wrap over the other until I found a positioning I liked and then marked it. 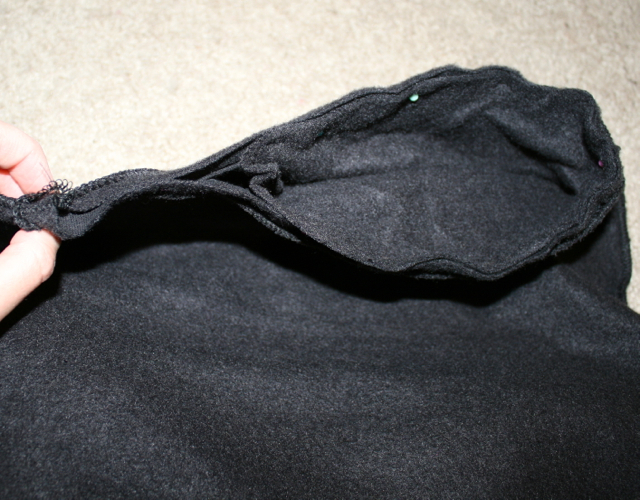 I cut a (very, very, so small) slit in one side and sewed a button on the other. The slit doesn't need to be very big- it will stretch to go over the button. If it's too big, it won't stay closed over the button. 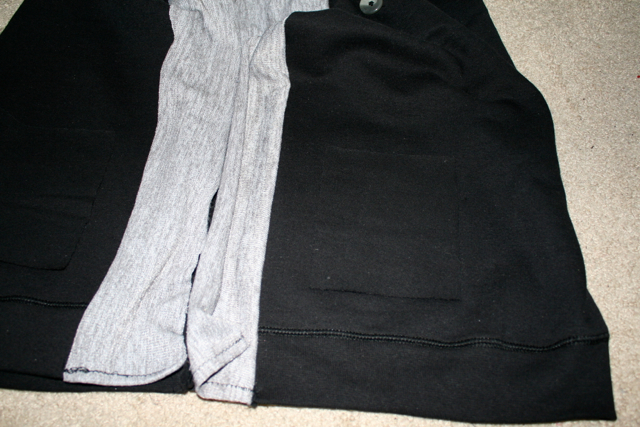 Lastly, I added pockets. I was way too excited by this point to do anything time consuming. 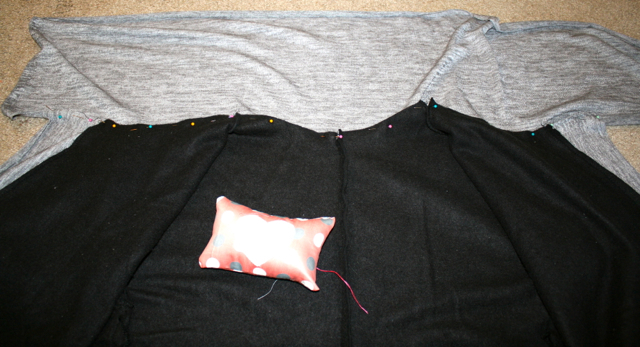 I cut two squares from the extra fabric (that I took from the arm area) and pinned them in place. Then I ran a straight stitch over top of the fabric (sooo simple) from the top of one side to the top of the other, closing three sides and leaving the top open. Here the wrap is open, the collar is spread out. Here the wrap is buttoned closed with one side of the collar tucked in. Wrap buttoned closed, collar open. Wrap buttoned closed, collar wrapped around the neck. There are tons of ways to wear this. If you leave the fabric attachments long, you'll find even more. 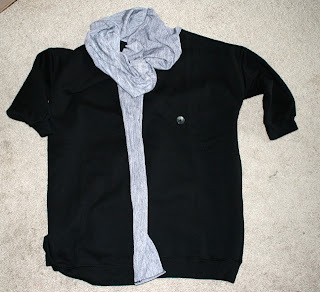 I can't wait to make another (with long sleeves). I realize this isn't as easy or clear as my other tutorials- I apologize. Because I made this in a completely different way than anticipated, I found myself altering on the spot before I could get a picture. If you need help- PLEASE ask! Have a great day everyone! As always, thanks for reading! 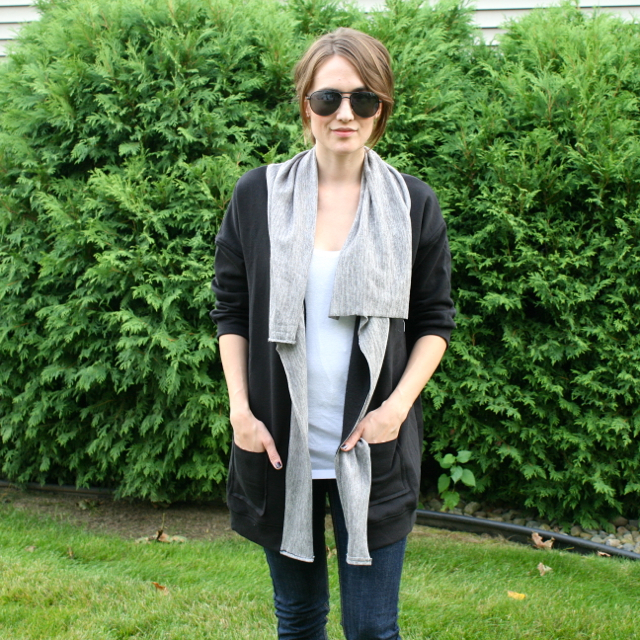 Love fashion DIYs that are different and unique! Reminds me of the Bina Brianca Wrap which you can wear in so many different ways. This is so nice! I love this, so unique. Great tutorial! I really like it. Thanks for sharing such nice very useful information.